Everyone loves a good comfort meal, so why not talk about some good ol’ bev and veg comfort! 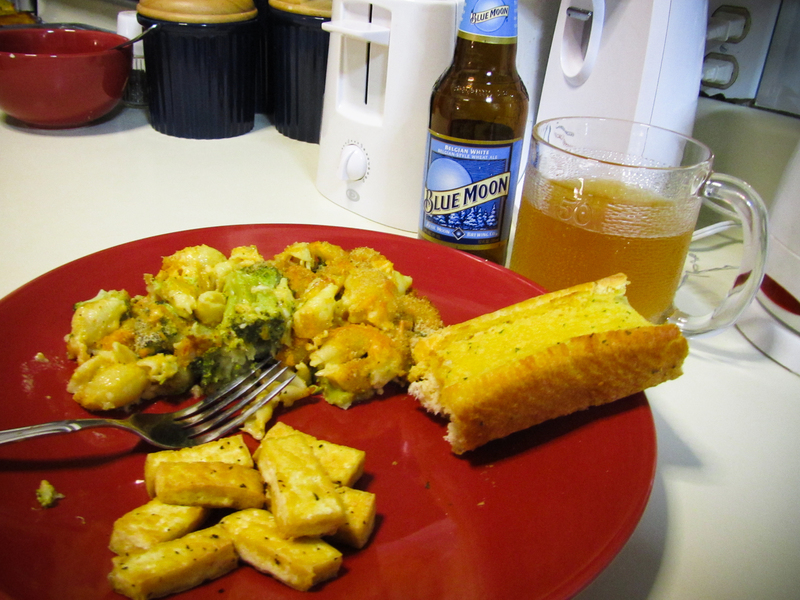 It was a chilly day here in Indiana, and I decided to make some of my favorite vegetarian comfort foods, and pair it with my comfort beer. I’ve been making this baked mac and cheese recipe for quite some time now, and I love it more every time. It’s a wonderfully delicious comfort food that I found in the Betty Crocker Vegetarian cookbook, and it’s online here. I have several modifications though. 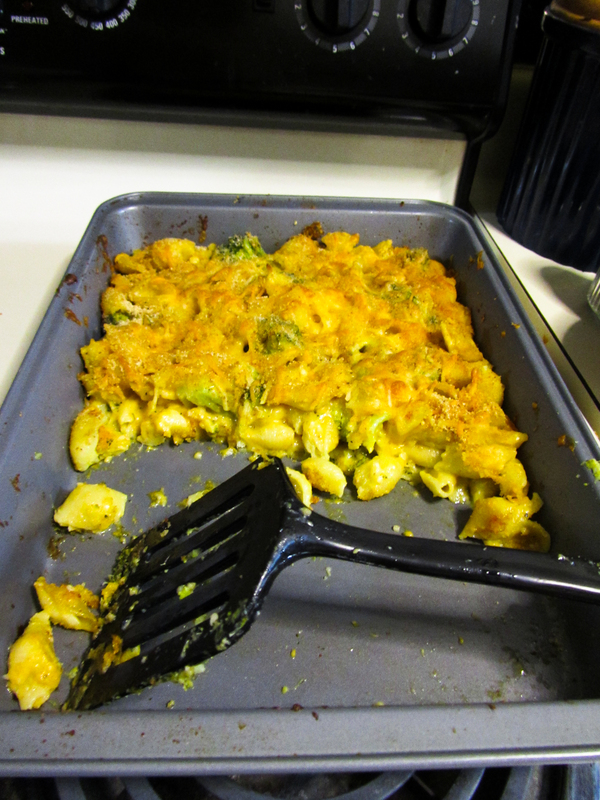 I replace the onions with broccoli florets, use cheddar instead of American cheese, and use shell pasta. I cook the dish in a 13 x 9 pan instead of a casserole dish, which gives more surface area for the top to get a bit more crunchy and melty. Also, right before the pan is ready to go into the oven, I sprinkle some additional shredded cheese over the dish and sprinkle bread crumbs on top of that. This gives it an extra bit of crunch and texture that makes this basic dish extraordinary. I pair the mac and cheese with very basic, yet delicious, tofu. I heat up olive oil mixed with some basil in a frying pan and cook the tofu on both sides until yellow or golden brown. This way it is relatively plain by itself, but goes perfectly when mixed into the mac and cheese after cooking. Garlic bread is pretty self explanatory…goes well with anything pasta! The beer was a tough choice; I couldn’t decide to go with something that would parallel the dish, or would complement it by being somewhat spicier and opposite. I chose to go with my favorite “comfort beer,” Blue Moon. The smooth wheat taste is so satisfying, much like the mac & cheese. Though Blue Moon, and other wheat beers, are traditionally paired with an orange slice, I chose not to use it in this case; I thought the fruitiness would be overwhelming and too summery for a winter dish. Now that I’ve tried this pairing once, I would like to try it again with a darker, “hoppier” beer or an amber ale like Fat Tire (or like Bloomington’s local brewery’s BBC Ruby Bloom).